NEW DELHI: India today asked China to invest in setting up manufacturing units in the country to bridge the widening trade deficit and create jobs in the country. Commerce and Industry Minister Nirmala Sitharaman said India has signed an agreement with China in June to set up Chinese Industrial Parks in India. “We are expecting Chinese to come and invest in India. We have been able to convince Chinese to manufacture those goods which they export…It is going to create more jobs in the country,” Sitharaman told reporters here. She also said that both India and China are expecting announcements during the forthcoming visit of Chinese President Xi Jinping to India this month. “With regard to Chinese President visit, we are expecting a lot and they are also expecting a lot…hopefully there will be lots of announcements,” she said. 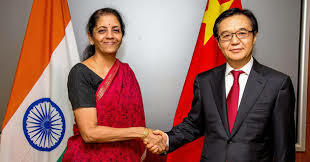 In the last three months, Sitharaman has visited China twice and discussed various ways to enhance trade and investment between the countries. The bilateral trade between the countries stood at $65.85 billion in 2013-14. The trade deficit was about $35 billion. India has time and again sought greater market access for Indian goods and services in the Chinese market. India is asking China to open its market for Indian IT and Pharmaceuticals besides stepping up investments to compensate the trade deficit. India is expecting China to set up four industrial parks in different states. China has invested only $410 million during April 2000 and June 2014.